I am working on a chapter-by-chapter synopsis of my work-in-progress, Death Rides the Zephyr, aka the train book. Some folks would say that’s topsy-turvy. Shouldn’t the synopsis, or outline, come before I start the book? Well, it does. But that earlier synopsis is a rudimentary road map. When I start a new project, I usually – though not always – know where I will begin and where I want the book to end. But what happens in the middle? And in which order? Not quite sure. Those pesky middles are terra incognita. So at some point, when the book is well underway, I step back and examine what I’ve written this far and create a more detailed road map, trying to navigate a path through terra incognita. My preferred tool is this more detailed chapter-by-chapter synopsis. I focus on what has happened so far, in great detail, until I get to the point where I am now. I find that as I look at the earlier chapters, this exercise brings me to a clearer picture of what has to happen to get my protagonist and my plot to the end. Death Rides the Zephyr takes place in December 1952, aboard a train, the old California Zephyr. The CZ, known as the Silver Lady, was a sleek streamliner with stainless steel cars, lots of amenities and a Zephyrette – a train hostess – who was the only woman crew member. The train was jointly operated by three railroads – the Western Pacific, the Denver & Rio Grande Western, and the Burlington Northern. In my novel, the train leaves Oakland on a December morning, heading east on a run to Chicago, through California’s Central Valley, the Sierra Nevada, the Great Basin and into the Rocky Mountains. The novel ends as the train reaches Denver, but a lot happens in between, such as murder, mayhem, and a missing person. This may be the most challenging run my Zephyrette protagonist has ever had. The train is moving for most of the book, with stops at stations. For this reason, I’ve spent a great deal of time poring over passenger and employee timetables, because I must know where my characters are and even what they see when they look out the train windows. I’ve moved scenes around the pesky middle of this book so that the action in those scenes can take place at specific locations along the train’s route. I also have diagrams of railroad cars tacked up around my computer. I’ve made changes to passengers’ accommodations, to better serve my plot. My exercise is helping me deal with the pesky middle of this book. I have a much better idea of where I need to go back and drop in a clue or two. I’m ready to move forward again, so all aboard! Like you, Janet,I often go back, after the fact, to note what I’ve already done, scene by scene, up to the chapter I haven’t yet written–then pin them up on a large sheet of paper. It helps, I think, to conquer that murky middle. I love the idea of a moving train–a little a la Christie? My spouse, especially, will love it. He’s an aerospace engineer who plays in his leisure moments with model trains. Janet–I rode the Zephyr from Oakland to Chicago ten years ago–I swear it didn’t look as if it had changed a bit since the 50’s. 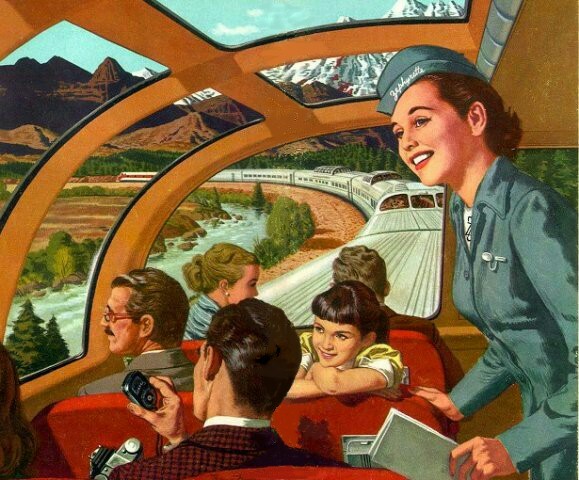 I do remember pretty well exactly what we saw from Oakland to Denver (and when–including how late the damn train ran), and also exactly the lay out of our private compartment and the dining car and viewing car–which looked almost exactly as it does in your illustration. So your post was a real flashback for me. Can’t wait to read the book. And hey, if you want to pick my brain about stuff I saw from train windows and inside the train just email.